Birmans have been called the “sacred cat of Burma.” There are a lot of legends about Burmese priests living with, protecting, and even being accompanied to heaven by this distinctive breed. Those piercing blue eyes and that gorgeous white fur would certainly earn the favor of any goddesses that happened by! Modern Birmans came to France from Burma (the country now known as Myanmar). They were originally bred to be companions to priests. Whether or not they’ll accompany you into the afterlife, this kitty is sweet enough to make you think you’ve already gone to heaven. This breed can grow to between 6-15 pounds and lives an average of 15-20 years. WHAT IS THE BIRMAN’S PERSONALITY LIKE? Birmans are lovely feline family members, and do well as the only cat in your home and heart, or as part of a larger kitty family. She’s gentle, sweet, and quiet—unlike some “wild” cats we know (ahem, Bengals). If you’re away from home a lot, she’ll be happier with another pet to keep her company. While inquisitive and playful, Birmans aren’t much for vertical exploration compared to other cats. You won’t have to worry as much about her knocking pictures from high shelves. WHAT IS BIRMAN BEHAVIOR LIKE? If you chat with this cat, this cat will chat back. Otherwise, Birmans tend to purr quietly. She’ll eagerly learn tricks and play with you. Considered one of the more well-mannered cat breeds, Birmans are known for being especially loving and calm. HOW CAN I KEEP MY BIRMAN ENTERTAINED? Your Birman is one smart kitty. She’ll enjoy figuring out puzzle games and other self-directed interactive activities, as well as playing fetch with a ball (and you, of course). WHAT DO BIRMANS LOOK LIKE AND WHAT ARE THEIR GROOMING NEEDS? If you’re looking for a snuggle buddy, you can’t beat a Birman. She loves to linger in your lap, and her fur feels like a bunny’s. These kitties are born pure white and develop their points and colors over the next two years. They look a bit like Ragdolls or Siamese, and their paws (or “gloves”) are consistently white. They also have shorter noses and faces than their Siamese counterpoints. Plan to comb your Birman a few times a week to keep her looking and feeling her best. Your cat’s coat and skin can tell you a lot about her health and well-being. Healthy cats have coats that are smooth and shiny; they should have supple, clear skin. Nutrition and wellness factor heavily into the texture and luster of your kitty’s coat, but you can help keep her looking and feeling her best with regular skin care and grooming. WHAT HEALTH PROBLEMS DO BIRMANS HAVE? 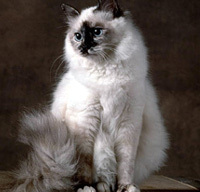 Birmans are a generally healthy breed, but can have minor sinus problems. Remember that cats often hide disease symptoms! It’s important to bring your furry friend in for veterinary checkups at least once a year. ARE BIRMANS GOOD FOR PEOPLE WITH ALLERGIES? Birmans aren’t among the breeds generally recommended for allergy sufferers. Remember that no breed is 100% hypoallergenic, and any breed can aggravate allergies. You can reduce your furry friend’s impact on your allergies with daily brushings. This will reduce pet dander and loose hair floating through the air you breathe and landing on your clothes and furniture. (Bonus: think of the money you’ll save on lint rollers.) If your pet allergies are mild, a regular grooming session could have a big impact on your quality of life with your pet. WHAT IS MY BIRMAN’S BEST DAY? SHOULD I ADOPT A BIRMAN? This kitty will be happiest with a family able and present to return her affections. But honestly, it’s hard not to love this cat. Birmans are fluffy, sweet, gentle, and affectionate. They’re lovely to look at and soft to the touch. Who wouldn’t want to bring this furry angel home? Have you decided that a Birman is the purr-fect cat for you? Why not be your new best friend’s hero and adopt a rescue! Be sure to check out our article on what to expect when you’re adopting a dog or cat.